When Sarah Lacy achieved some success in tech journalism, she decided she could take the leap of having a child. She knew the discrimination and setbacks that working mothers could face, but realized that this might be the best moment. So she had a son, and then she had a daughter, and then she built a new company from the ground up. Lacy's book is a rallying cry for women to realize that having children does not make you a less valuable employee and being someone with passion for your career does not make you a bad parent. 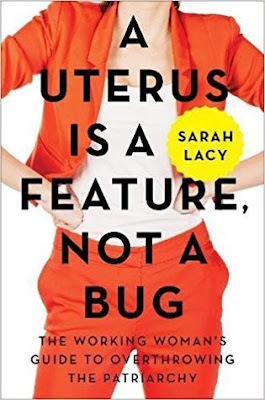 The Uterus is a Feature, Not a Bug is several things combined between two covers. It's one woman's story of rising through a mainly male profession; it's a deep dive into the statistics that prove that women and parents in the workforce are a strength, not a weakness; and it's an exploration of what we can do to change workplace culture. Lacy covers a lot here, but one of the most interesting things is the idea of benevolent sexism. She writes about superiors who would never call themselves sexist, but might have neglected to place you in the running for a promotion because you have a small child or you're too "nice" for management. Lacy also destroys the idea of "distracted mothers." The whole concept is a bit ridiculous--are we actually proposing that non-parents have never been distracted by things going on in their personal lives? And "mommy brain?" Parents can be some of the most focused, productive workers; they know there is no time for chatting at the water cooler or perusing the internet because they want to make it home for that bedtime story. Some reviewers have pointed out that Lacy can be divisive where she means to be unifying: if you open your book by pointing out that non-mothers can never understand what it's like to birth and raise a child, you are dividing (and perhaps offending) some of your readers right from the start. But I think she is right to point out that, whether or not you intend to have children, women are often considered a liability because they might have children. Men's possible parenthood, however, is seen as a non-issue. This is not a perfect book, but I do think it's a great starting point for everyone--working moms and dads, their colleagues without children, and the bosses who are determining who gets a seat at the table with them. There is a clear need for change in our places of work. Some of us will become parents and some won't. But we need to leave the possibility for you to attend your child's play or take your parent to a doctor's appointment or just take a mental health day sometimes. If we could base our promotion and pay decisions on the merits of someone's work instead of sitting at your desk for a certain number of hours, I think we would see a huge shift in people's success and love for their jobs.